I waited tables all throughout college. By that time, I’d been a vegetarian for quite a while, but none of the establishments that I served in were meatless. Things could get awkward. I felt weird about telling customers I was vegetarian, but at the same time it wasn’t like I could go and suggest the filet mignon. I got some odd looks from people upon telling them that my favorite dish was a dinner salad with a side of mashed potatoes. The last place I worked at was Italian. 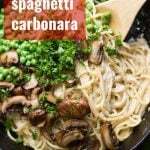 We did not have spaghetti carbonara, but I did have a customer ask for it once, and when I didn’t know what it was, she went into great detail explaining the dish and how freaking amazing it was, but it was all kind of lost on me. Bacon and eggs are two things I was never down with, in my early meat eating days. If you’ve been reading a while you probably know that vegan bacon and eggs are two things I’m way down with. In fact, I’m almost inclined to apologize here for overdoing it a bit in the vegan bacon department, but I won’t because you guys are going to love the juicy little bits of mushroom bacon that go into this one. I had to run the dish by my husband, because I’ve never actually had non-vegan carbonara. He said this version is better. Wow. We dined on two variations of this dish, his being sprinkled with kala namak for extra eggy flavor, which was apparently key to egging up the dish, mine without, because I wasn’t really keen on egging up my dish. But I loved the creamy sauce on it’s own. Make sure your tofu is silken! Silken tofu has a silky smooth texture that’s very different from the firm tofu most of us are used to. If you don’t see it in the refrigerated section with the regular tofu, check the international foods section, as it might be sold there in shelf-stable packages. Make sure to arrange your mushrooms in an even layer in your skillet when you cook them, and don’t crowd the skillet. If your skillet is small, cook them in batches. Want to make this recipe gluten-free? Just use your favorite gluten-free pasta and gluten-free tamari instead of soy sauce. Stir soy sauce, maple syrup, cider vinegar and liquid smoke together in a small bowl. Add sliced mushrooms and toss to coat. Allow to marinate for 30 minutes, tossing occasionally to recoat. While the mushrooms marinate, bring a large pot of water to a boil and cook spaghetti according to package directions, until al dente. Reserve 1/2 cup of pasta water, then drain pasta into a colander. Return to pot and toss with a bit of olive oil. Place cashews, silken tofu, milk and nutritional yeast flakes into food processor bowl and blend until smooth and creamy, stopping to scrape down sides of bowl as needed. Coat the bottom of a large skillet with 2 tablespoons of olive oil and place over medium heat. When oil is hot, add mushrooms in as even a layer as possible. Allow to cook until browned on bottoms, about 5 minutes. Flip and allow to cook 5 minutes more on opposite sides. Remove mushrooms from skillet and transfer to a plate. Add 2 tablespoons more of oil to skillet. When oil is hot, add garlic and cook 2 minutes, until very fragrant. 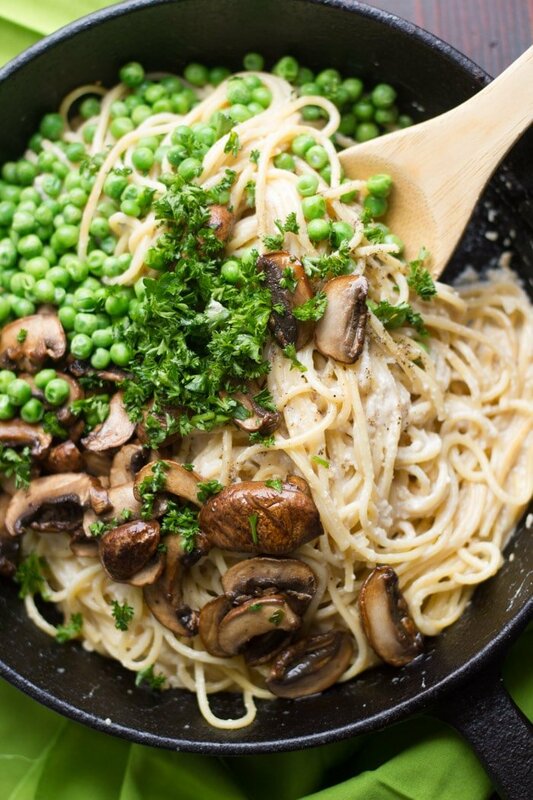 Add spaghetti, cashew mixture, peas, parsley and mushroom bacon to skillet. Toss everything a few times, until noodles are coated and ingredients are well mixed, adding some reserved pasta water to thin the sauce if needed. Season with salt and pepper to taste. Divide onto plates and sprinkle with red pepper flakes, cashew Parmesan and kala namak, if desired. Serve. This recipe makes a big batch. I don't recommend scaling down the batch size unless you've got a relatively small blending device for the sauce, otherwise you might not be able to get it to blend fully. Best carbonara you will ever have!!! Carbonara was one of my absolute favorites – so high calorie that I used to reserve it for my birthday….mostly. Going vegan was the absolute best choice I’ve ever made but I missed dishes like carbonara, gyros, etc. This is better than any I have ever had – including a $250 version in NYC a few years back! Lucky to have people who post their amazing ideas!!! Oh wow! I am SO happy to hear that!! Thank you for the wonderful review! 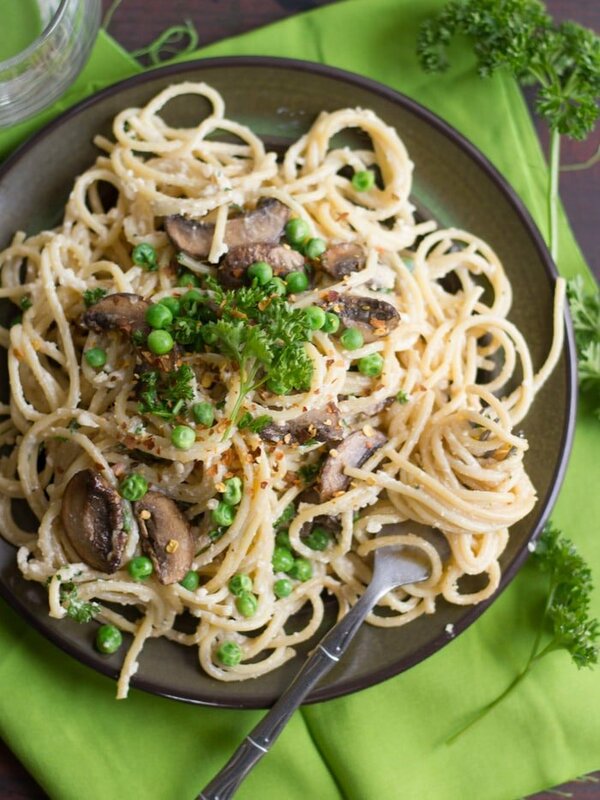 Thanks so much for posting , I just said last night , I wish someone would come up with a vegan carbonara :) looking forward to giving this a try , looks relishes , you rock !! Bookmarked this page! It looks and sounds like such a delicious meal! Definitely making this one. Looks delicious! Is there a fB button I am missing where we are able to share your recipe from an email and post directly to fB? That would be so helpful. Do you need to drain the tofu before putting it in the blender? Nope! It’s silken tofu, so it’s it’s not packed in water like regular tofu. It’s more like a custard that you can scoop right out of the package. Just made and it was absolutely DELICIOUS! I downplayed how much I would enjoy the mushrooms lol, next time i am putting in significantly more – they were the best part! Will be making again, thanks again for the recipe! Yay! The mushrooms were my favorite part too. :) Glad you enjoyed it. Thanks for your comment! I just made this, and it’s incredible. 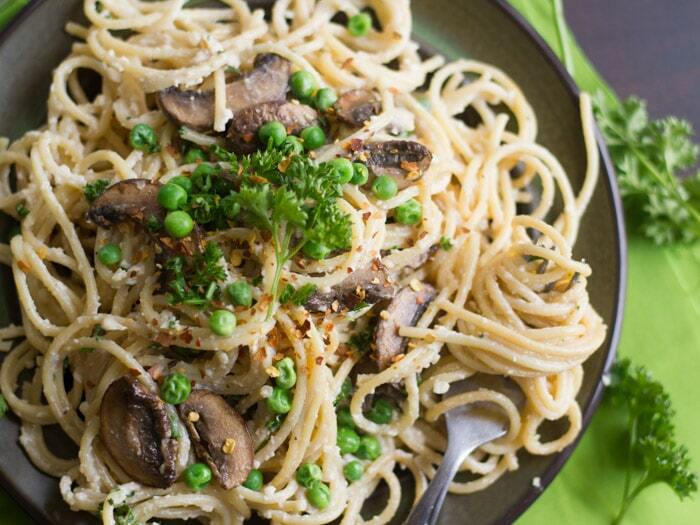 I’m vegetarian (and a huge fan of carbonara from the meat-eating days), my boyfriend is vegan, and we’re both in love with this dish. Thank you! We made this tonight and it was delicious! We love spicy food so extra black and red pepper amped it up to our preferred spice level. Wow! I just made this and I’m on my second bowl! This was my first time cooking with silken tofu and I wasn’t sure if I would be able to pull it off. But it turned out great! Thanks for sharing! Awesome! So so glad you enjoyed it!! I love pasta and yours looks delicious. It makes me want a bowl of it right now. Using cashews is so good for me because I always need to increase magnesium in my diet. And mushrooms are also my favorite, a winning combination, perfect. Made this last night. Absolutely delicious! Looking forward to making.many more of your recipes. This was our first. Thanks Angelina! I’m glad you enjoyed this! Just finished scoffing this down. Absolutely fabulous, and I mean FABULOUS! My parents are here visiting and they raved on about this meal. This dish is a keeper. I make new dishes at least three times a week and this is the best in quite a long time. I did cut back on the oil by frying the mushrooms with a spritz of olive oil from a can and did the same with the garlic. I swear I’m probably one of a handful of chubby vegans out there lol. I also added the black salt directly to my sauce before blending it all. Forgot to soak the cashews so I let them soak in boiled water for 30 mins. Vitamix did the rest ;) Thank you so much for a really, really, really great meal. Did I say really enough? Last night’s new meal was somewhat of a flop so I was thrilled in presenting this scrumptious dinner tonight. Thanks again! Awesome! I’m so happy to hear that it was a hit! Thank you so much for such a thoughtful review!! Does it matter if you use firm or soft tofu? Silken has a couple varieties. I made this today and it is PHENOMONAL. Absolutely decadent. Killer recipe. Do I drain the mushroom marinate or cook it with the mushrooms? Also, do I drain the tofu? Oh WOW! Just made this for the first time tonight and I am THRILLED with how it came out! It is sooooo creamy and flavorful. Love the mushroom bacon — I was a little skeptical as I like the “crunch” of tempeh bacon, but the mushrooms were perfect. A new favorite recipe! I’m so glad to hear that! Thanks so much Marlene! I’m making this tonight! You say it makes a lot, do you know if the extra sauce would freeze well? I’m not so sure it would, because freezing tofu tends to alter the texture. You’d be fine to keep it in the fridge for a couple of days though. Delicious. My mushrooms soaked for a few hours Nd were still delicious. Looks delicious! Any suggestions for making this nut free? Please & thank you! Thanks! Hemp seeds might work as a substitute for the cashews. You don’t need to soak them, but I’d blend them up separately to start just to make sure they get fully blended. Yup! I use a similar marinade for coconut, eggplant, tempeh…all kinds of stuff! Just made this for dinner…delicious! Glad you like it!! Thanks Allison! i have to say that I have tried many of your recipes and have not been disappointed once. This was supper last night and we LOVED it. You have now made it onto my “favourites” so now I can find you easily. Thank you so much for sharing your recipes, we really appreciate it. I’m so happy to hear that! Thanks so much Kay!! My picky family devoured this! Thank you so much for sharing your recipe! Delicious! Yay!! I’m glad it was a hit! Thanks Jean! This looks delicious. It has all my favorite ingredients. 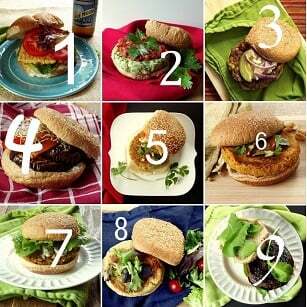 It’s making me hungry just looking at those photos! Thanks Helena! I hope you get to give it a try and enjoy it! Any recommendations on what to do if I don’t eat tofu??? Maybe try some unflavored vegan yogurt. I haven’t tried that myself, but I could see it working!